ABUJA- CHAIRMAN, Senate Committee on the Federal Capital Territory, FCT, Senator Dino Melaye, APC, Kogi West has been arrested by operatives of the Special Anti Robbery Squad, SARS. Vanguard gathered that Senator Melaye was this morning, taken to the SARS detention facility located just opposite the old Central Bank of Nigeria, CBN junction along the Area 1 expressway. The SARS detention facility is reputed for imprisoning hardened criminals arrested for theft, murder, cultism and other criminal acts. It was gathered that the Nigeria Police Force forcefully carried out the arrest of Melaye without arrest warrant or court order. In a telephone conversation this morning, Senator Mekaye however sounded rattled, as background conversation suggested a struggle between himself and some of the operatives after which his mobile lines were switched off. 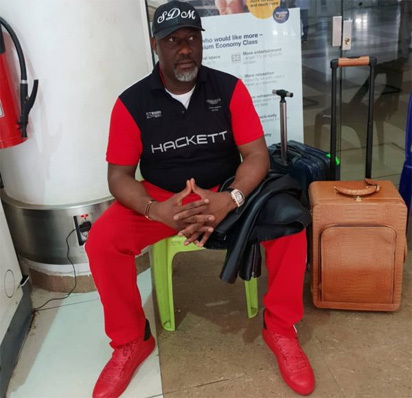 Recall that initial attempts were made by the police to arrest Senator Melaye after immigration officials disembarked him from a flight to Morocco on Monday morning. Following his release after three hours detention at the immigration office at the airport, the lawmaker’s house was besieged by over 80 armed police men from noon yesterday until the early hours of Tuesday.